In schools and community centres space is at a premium, so any products that help to make the most of a flexible space are worth their weight in gold! This is the theory behind our new folding tables range... they provide a stylish, practical and functional dining table - which can be effectively stored away when not in use. 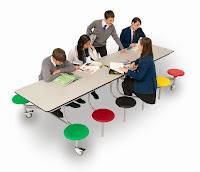 If you need to create a flexible dining area in your school hall, then these can be wheeled out at a moments notice, easily unfolded and locked for safe and stable use - and then wheeled away again to free up the space. The ease of this movement is essential to make the endeavor worthwhile, so a lot of time has been taken to ensure that the design is user friendly and practical. A free product demonstration is also offered with most orders, to make sure that you're making the most of the expansive capabilities of the design. It's also important to make sure that you're maximising use of your space with the most effective layout. A popular perception of this flexible style is that they'll end up in a mish mash across the space, with a different layout every time. To avoid this, we'd recommend taking advantage of our free space planning service. From your dimensions we can put together a full plan of your space to make sure you're optimising the available area, and you can keep the plans handy so that they can be replicated time and again! A range of finishes are also available as well, for both the tops and the seats, so you can create a colourful design to really bring your space to life. Some of our ranges are also available with a Smart Top design, which is perfect for interacting with and rewarding children. With themes such as history and nature, you can create a design to keep everyone entertained during their lunchtime! 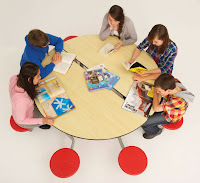 Make the most of all of your available space, with flexible and practical tables. 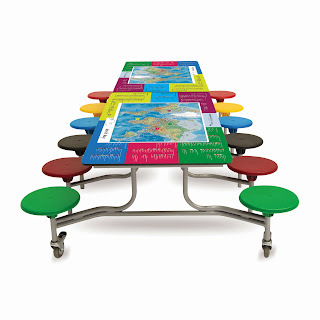 Easy to move, store and set up again, our folding cafeteria tables are the perfect solution to the multi-purpose space!